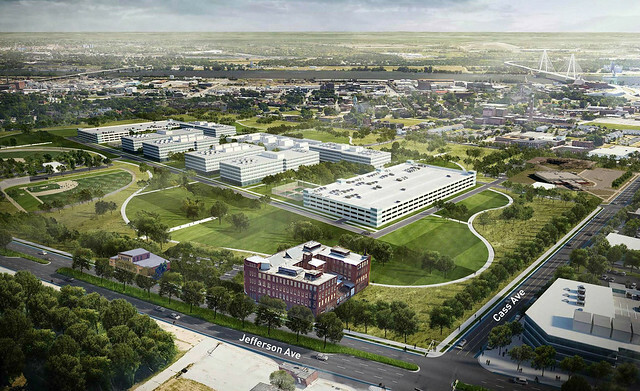 Does the NGA Really Need 99 Acres? I'll start this post by saying that I support keeping the NGA within the City of St. Louis. Not only does the City need the 1% tax revenue from the 3,100 jobs, but there are the secondary and non-monetary benefits of keeping 3,100 people employed in the center or the City. 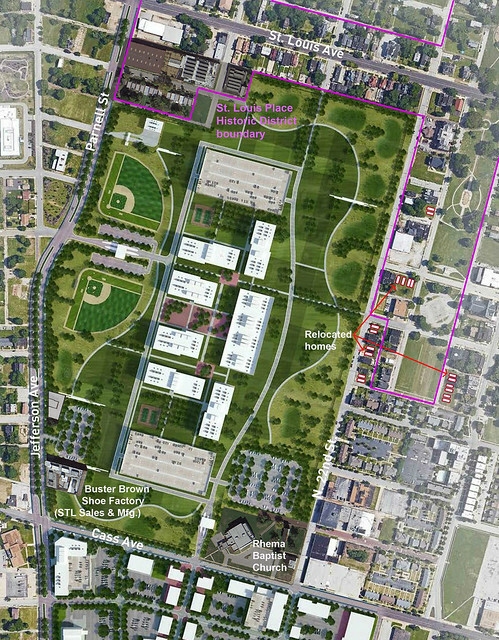 As you may have already seen, the NGA recently released the Draft Environmental Impact Statement (DIES) which is an evaluation of the social and environmental impacts and benefits of constructing the new NGA campus at each of the four locations that are in the running for the development. 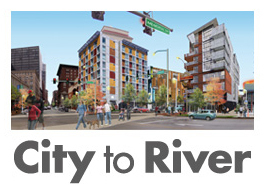 Besides supporting a location within the City of St. Louis, my comments revolve around preservation of historic and cultural features that are located within the current City site boundary. 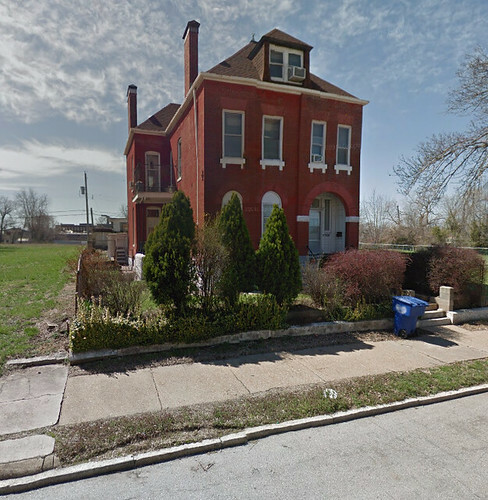 The City of St. Louis established the site boundary and with a wave of the planners hand, assumes automatic destruction of everything within the roughly rectangular area set bound by Jefferson Avenue, Cass Avenue, 22nd Street and the alley south of St. Louis Avenue. This practice of clear-cut demolition of everything in a 24 block 99 acre areas of the City reeks of 1950's and 60's "urban removal" planning that permanently scarred cities across the US including many areas of St. Louis. The big difference here is that most of the land under consideration is already vacant, but that should not condemn everything that is left to destruction if the opportunity exists for strategic preservation. Does the NGA need all 99 acres being proposed? According to the DIES, NO. The DIES states that the NGA vetted 186 potential sites prior to narrowing down to the current four in contention. One of the filters listed was that the site had to be at least 50 acres, not 100 acres. This is a big difference in site size. While the other sites under consideration are 101 acres, 167 acres and 182 acres, the fact remains that 99 acres is not a requirement according to the DIES. 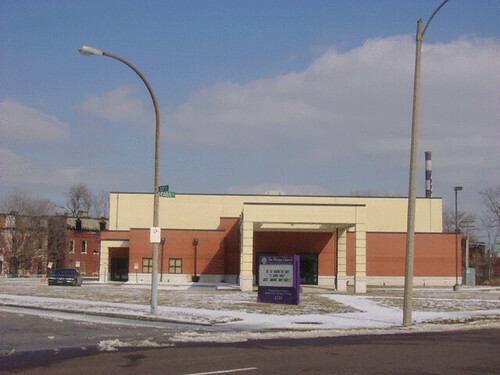 The graphic above from the DIES shows a proposed security fence that cuts into the site at the northwest and southeast corners, which correspond to the 2500 block of Montgomery, which is located within the St. Louis Place National Register Historic District and to the Rhema Baptist Church, which was at one time carved out of the NGA site boundary. 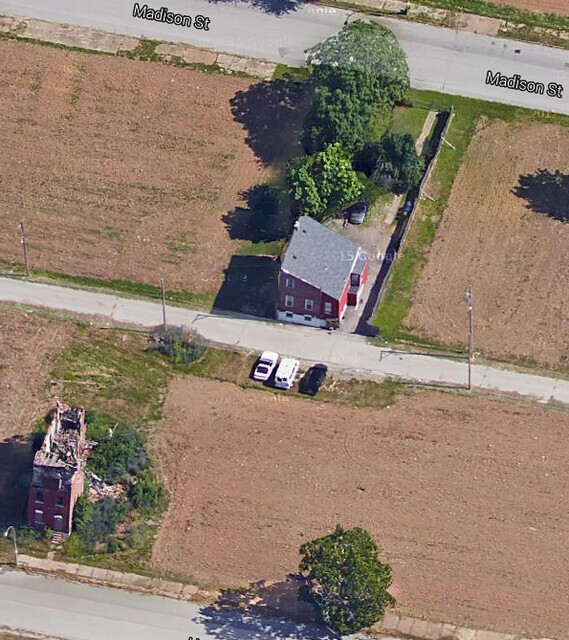 The modified site plan at the top of this post and the modified aerial rendering above represent what is possible with targeted preservation of historic and cultural resources. 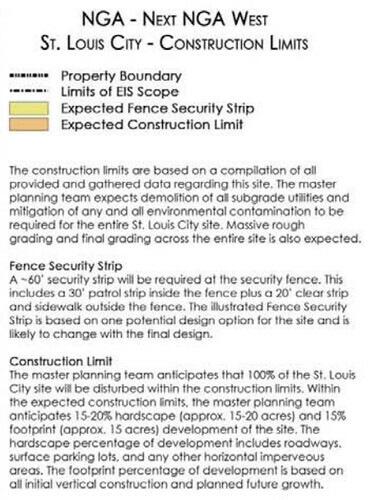 It should be noted that the site layout and buildings shown in the base images are a theoretical plan produced by the St. Louis Development Corporation and packaged in a site briefing book meant to sell the NGA on this site. 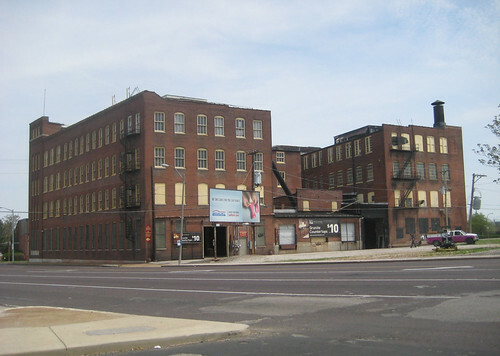 Starting near the intersection of Cass & Jefferson is the former Buster Brown Blue Ribbon Shoe Factory, which is listed on the National Register of Historic Places This historic 4-story brick structure is occupied and in-use by St. Louis Sales & Manufacturing, a cabinet and countertop outlet. 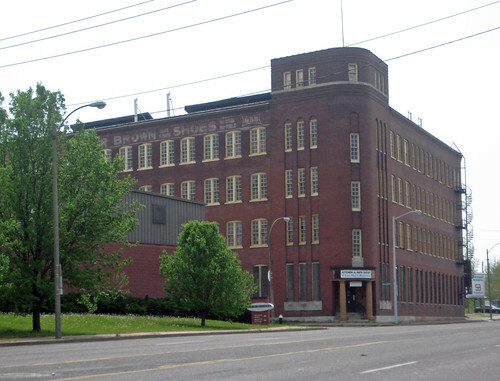 While it doesn't front on the intersection, the rear of former Buster Brown factory still presents a strong urban presence at Cass & Jefferson. 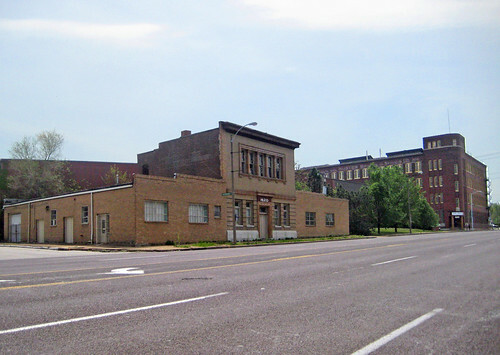 A block north of the shoe factory is a stately two story structure that was an addition to the Homeopathic Medical College of Missouri. Under current requirements for National Register listing, because the original college building located on the corner was long ago demolished, the addition lacks "integrity" and is technically ineligible for listing on the National Register. As a result, the building is ineligible for protection under Section 106 which reviews impacts of federally funded projects on historic resources. As Michael Allen points out in his article "Is the National Register of Historic Places Helping or Hindering Legacy City Preservation? ", maybe it is time for a change to the hard and fast rules that often result in the demolition of buildings worthy of preserving. I strongly agree. 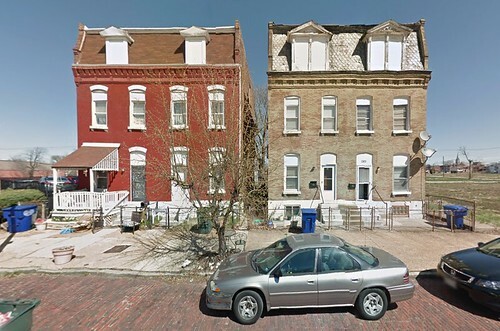 A few blocks north off Parnell the 2500 block of Montgomery, which is within the proposed NGA and part of the St. Louis Place National Register Historic District (photo from the districts nomination). 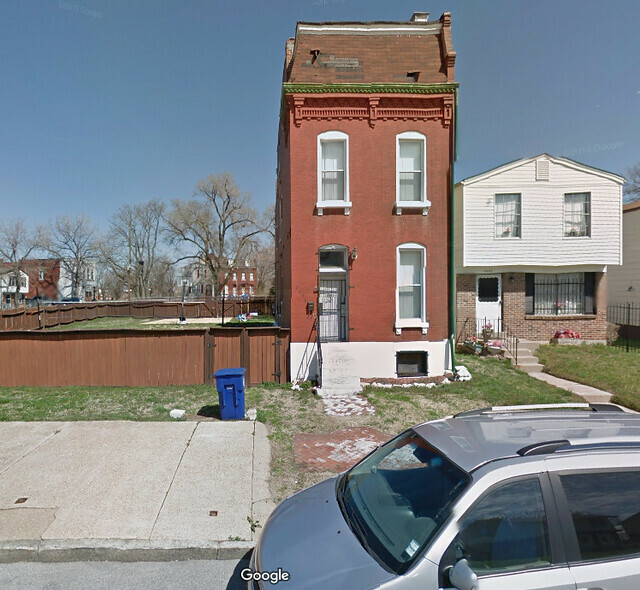 With 15 homes tightly spaced in a row, this is by far is the most intact block within the proposed NGA site. As mentioned above, this block lies outside the potential security NGA fence line. 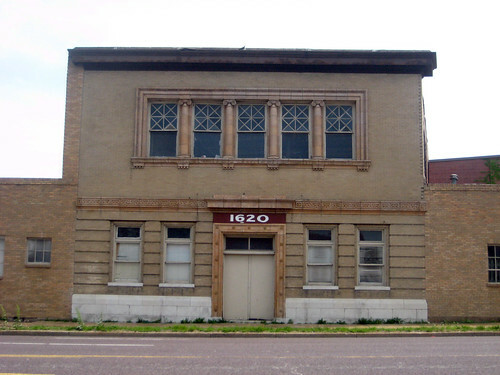 The Rhema Baptist Church at the corner of 23rd & Cass, while not historic or architecturally significant, could certainly be considered a cultural asset worthy of consideration. As you have probably have heard, the St. Louis Board of Alderman have approved the use of eminent domain to acquire property to assemble the site for the NGA. 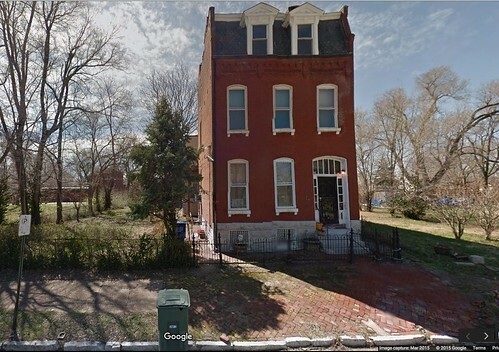 As of last week 66 property owners have already agreed to buy-outs including an offer to a longtime homeowner Charlesetta Taylor to move there three story circa 1894 house on North Market pictured above to a lot off-site. 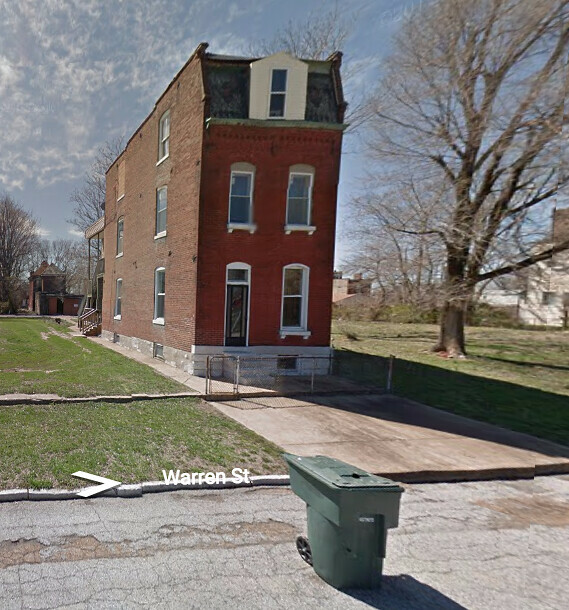 Taylor also happened to be a longtime opponent of the City effort to lure the NGA to North St. Louis. The agreement to move this beautiful residence is very welcome news, but many other home owners live in beautiful structures that could be demolished. Another homeowner, Joyce Cooks, who has lived in a three story 15 room home for 40 years is rightly concerned with how she would replace such a house. 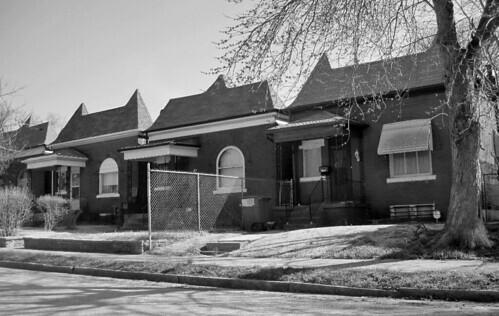 The right thing to do is to offer every owner of these irreplaceable solid brick homes the same opportunity to move their homes to existing vacant lots outside of the NGA site area. 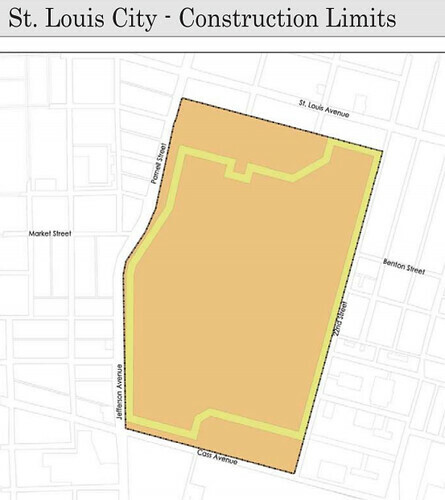 This could actually strengthen the area around St. Louis Place Park by moving stable owners and their well cared for homes to the neighborhood around the park. Below are several examples of structures that had they been built a few blocks east would be contributing properties in one of two National Register Historic Districts, but because of "loss of integrity" the homes (and owners) are considered disposable. While moving these houses may be more expensive in the short run than buy-out and demolition, the long term benefit to the larger neighborhood is worth it and the money saved not buying out the Buster Brown Shoe Factory and Rhema Baptist Church would more than cover these added development costs, and would result in a more intact neighborhood instead of the appearance of a giant spaceship like building landing on wasteland in the middle of the City.